I've had this short novel brewing and under wraps for a few years. Hiding it under a bushel, maybe? I wrote it as a story to convey the beauty and complexity of compassion as I have observed it being practiced in urban neighborhoods over the years of my service in them. Though I enjoyed creating this story, I make no claim to being a novelist. This is my first work of fiction. I've likely broken lots of novel-writing rules without realizing it. Still, I think it pretty much conveys what I want to express. 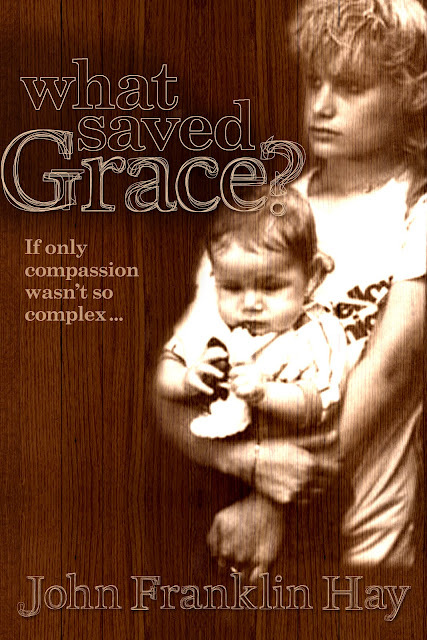 I published "What Saved Grace" as an ebook through Smashwords on March 23, 2013. It is available in multiple ebook formats for $4.99. Initially, the title is available at Smashwords.com, but accessible on Amazon and other online booksellers in April. When a struggling young family moves into an urban neighborhood and seeks help, they find themselves trying to navigate the conflicting compassionate responses of well-intentioned people. As the do-gooding neighbors of Theo and Grace try to sort out how best to help, a sudden health crisis in the family further reveals mercy’s complexities. Through divergent expressions of care, something unexpected and rather wonderful emerges. This story meets us in our universal desire to offer compassion to people in crises. At first glance, compassion seems simple. A second look begins to reveal its complexities. The ways we try to help people are all over the map. This story explores the sometimes-conflicting range of responses. What happens with Theo and Grace as they seek help from do-gooders who don’t agree on how best good should be done? The compassion they encounter both endears and bewilders. Reading this short, straightforward story will change the way you view compassion. In “What Saved Grace,” you will walk with Grace as she seeks food for her family at a church pantry and a Catholic Worker hospitality center. You will meet Pastor Rick and Sister Mary, who have very different ideas about how best to help Grace and her family. You will meet David, who lives across the street from Theo and Grace--a neighbor with a knack for growing a good garden. When Grace is suspected of cheating to get more than the agreed-upon food limit from the local pantry network, different approaches to helping sharply collide. Distinctions in compassion become even more transparent when a family member becomes critically ill.
Pastor Rick is carefully observing the sometimes heartening, sometimes confounding impacts of do-gooding in the lives of Theo and Grace. Once sure of the terms and purposes of his approach to compassion, he begins to challenge the underpinnings of his views as he works with the couple and interacts with others who are simultaneously helping them from different assumptions and for apparently different reasons. At one level, “What Saved Grace” is a short, straightforward fiction story about compassion. At another level, it is a serious exploration of the nature of compassion and compassionate responses to people in crises. It fleshes out the impacts that the worldviews of caregivers have in the lives of those whom they help. While this story can be quickly read and simply enjoyed, the manuscript has also been used as a study and discussion guide for people who are preparing for--or are actively engaged in--human services and compassionate ministry. However you read this story, your understanding of compassion will be expanded and your practice of it challenged. I am announcing publication of "What Saved Grace?" here, on my twitter account (@indybikehiker), via Facebook (www.facebook.com/bikehiker) and at www.smashwords.com/profile/view/indybikehiker. Hope you'll consider reading it!